The Purple Rain legend passed away at his Paisley Park studios in Minnesota on Thursday (21Apr16), but multiple sources reveal to TMZ.com the singer never left instructions about how he wanted his fortune to be divided after his death. 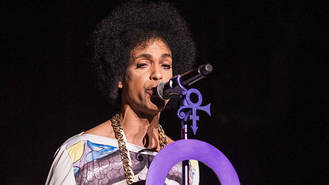 Insiders claim Prince was advised to consider laying out his final wishes in the event of his demise by various professionals, but he was not interested in drafting a will. As a result, his six brothers and sisters look set to benefit from the music icon's huge wealth, as Minnesota law dictates a person's closest living relatives will equally share in the estate in the event a resident dies without a will. According to TMZ, Prince and his sister Tyka Nelson shared six half-siblings, but two are deceased. However, any children the late siblings may have had would also be entitled to their parents' share of the estate, which is claimed to be worth less than $150 million (£104 million). Sources tell the website Prince struggled with some financial issues in his later years, allegedly spending more than he made, as he always refused to cash in on the rights to his music catalogue. Initial reports had estimated his fortune to be worth a staggering $300 million (£207 million). Representatives for Prince and his relatives have yet to comment on the reports about his lack of a will. The singer's passing occurred a week after he suffered a mid-air medical emergency, prompting the pilot of his private jet to make an emergency landing in Moline, Illinois so he could be briefly hospitalised while en route home from a gig in Georgia. At the time, his publicist blamed the health scare on a nasty case of the flu, but reports suggest he had actually been treated for an overdose of painkiller Percocet, which he had been taking for hip issues. An autopsy to determine to his cause of death was completed on Friday (22Apr16), but the results are pending further tests.